As stated, one of the main challenges of the project was to identify who took the photographs and when, and how certain images came to be preferenced for circulation between the various officials for their own reference as well as in both official and popular publications. The slide above demonstrates visually some of the connections between the British officials and other photographers in the exchange of these photographic objects over time and space. 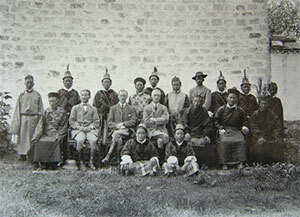 Sir Charles Bell (centre, top left) was resident in the border areas of Tibet from 1904 onwards and began making a visual record of Tibetan culture from that point on. His collection does not, therefore, solely reflect his time in Lhasa during 1920-21. However, during the time he was in Lhasa he exchanged images with the Medical Officer who was his companion on the Mission, Lt Robert Kennedy, and the collections of both men reveal shared and duplicated images, usually without the original photographer being recorded. 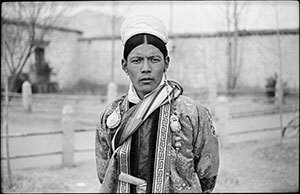 Bell also acquired images from David Macdonald, a long-term resident in Tibet who, as stated, worked as Trade Agent in Yatung and Gyantse at various points in his career. Macdonald also acquired many images from the lower ranking officers based in the region, such as Henry Martin and Willoughby Patrick Rosemeyer, as also did Sir Charles Bell. This exchange network also tapped into the photographic output of local photographers, such as Kaziman Nepalai, whom Sir Charles Bell identifies as the photographer of one image in his handlist [see PRM Photographs and Manuscripts Collection]. Also significant was that Sir Charles Bell used two cameras during this time, at least one of which was principally used by his Sikkimese orderly Rabden Lepcha. However, the photographs that Rabden took were universally subsumed under the principal identification of ‘Sir Charles Bell’. This enabled images to enter Bell’s collection taken with cameras that Bell owned but of which he was not necessarily the creator. Bell gave images to Sir Basil Gould. Gould then acquired images from all his mission staff, including Frederick Spencer Chapman, Hugh Richardson, Evan Nepean and Philip Neame, as they did with each other. They also exchanged images with Tibetan aristocrats, such as Jigme Taring. 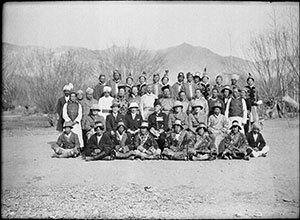 Hugh Richardson in particular seems to have expanded his collection of photographs quite extensively over the period 1936-50 by acquiring images from both local elites and other foreign visitors to Tibet. Thus, the fact that the members of the various Missions exchanged images between themselves (importantly including original negatives not just copies of prints), relates to diverse practices of exchange and circulation. Many of these British officials had publication projects and lecture tours in mind in the creation of their own photographic record and in the acquisition of photographs from other sources. The prestige of Sir Charles Bell in Tibetan government circles, and particularly the extended time in which he was permitted to stay in Lhasa, meant that his photographic record of the place and its people attracted great attention and many of the images have been repeatedly reproduced. Yet Bell acquired images in a constructed way to fill out visual gaps where he had been unable to make certain photographic images himself or through his orderly Rabden Lepcha, either to publish them or make reference to them in the writing of his books. As demonstrated, this process of acquisition tapped into a nexus of exchange among colonial officials, with each other as well as with the Tibetan, Sikkimese, Nepalese and Indian photographers they encountered. Rather than employing orderlies born in the region to expand the potential of image making during the mission by their ability to slip more discreetly into wider Tibetan society, instead in 1936-37 the extensive use of multiple cameras (both still and cine) was utilised to explore the technical opportunities and boundaries of photography in Tibet where points of actual contact remained constrained by official protocols. (Cf Harris Seeing Lhasa 2003:29-33) Yet the results were similar in that over a period of time the identification of who took a particular image, when and where, could become obscure. For many years after the mission the images continued to be exchanged and, as with Bell, were frequently published without acknowledgement of the photographer. The publication process itself could also lead to confusion. There is evidence of some confusion being generated in the Chatto & Windus offices, for example, when images were returned some years after the fact of publication and it was no longer clear which author owned which photograph with the result that images were sometimes sent to the wrong author/photographer. The project, therefore, had to untangle this complex nexus of relationships not only of people but of photographic objects and this untangling was common in developing the various methodological approaches towards the collections that will now be discussed in detail.